Well, apparently I have been snoring a little bit and waking up Cory. Cory: It is not snoring. Heavy breathing. I have never been told once I do something in my sleep. So, it is definitely a first time affair. I actually woke up early and watched the news. For the first few days I start out with orange juice and smores pop tarts. I know it is not the most healthy, but it makes me feel so good. I cooked bacon and eggs on Sunday for the guys and I am pretty sure they enjoyed it. You never know with the guys I am around because they could either be making fun of me or well just making fun of me. Maybe it is my Bruener quotes. More on that later. What to say about Cory? Cory is a good friend that I really do not hang out with other than on trips. SO, does that make him a good friend? ahh yeah maybe still cuz he is cool, nice, and a cool dude. I roomed with him a little last year and well he past on a great addiction to me. That is poker. I do not love poker, but it definitely passes the time down here. We only get 11 channels and daytime tv is not the best. Oh yeah and Danny being the nice guy that he is will not teach me to play Settlers of Catan. So, I am stuck playing poker or Call of Duty. What can I say about Mr. O'rourke? He eats my goldfish. Danny:I did not eat them I poured them in the trash. Eric: I asked him why he was eating them and to stop and then he dumped them all in the trash. Danny: Jed ask me how high my care factor was? Danny: Less than zero about Bruener's things. Eric: My care factor on his care factor is less than his. More or less had one goldfish and dumped the rest, thanks Danny. Danny has his momments in being nice to me. More of when he wants something. Danny: Liar, I gave you ambien yesterday. Eric: Well, that is true. He is like a big brother to me. Cory and I have our own wolf pack and we are jackals. Cory you want to be a jackal? Cory: I do not know what you are talking about. I do not want to be in any wolf pack or jackal pack. I miss Chad. He is at National Team camp. He was my partner in euchre and now that is gone. He loved my food also. He especially liked the goldfish. So, basically the wolf pack ate all of my goldfish. Not only am I alone in my jackal pack, I have a big brother wolf who is mean to me a lot and my other friend, that is a wolf (Chad), is gone, I may start crying right now. Soccer has been going well. Last pre-season I was not here in Florida. So, it has been nice to be with the team here, but a lot of running. Which is good for you, but you feel it later. Right now I am gonna do a response to Chad. I am starting to understand those comments that are stupid that I say. I try and be funny, but it is completely off base. Usually it is just a random comment. So, Adam and Jed have made up a secret word for me. When I say something stupid they say "cow" and I immediately change the subject and say something very general. It works great. It is like therapy for me, but I am not crazy, I promise. Danny: I love you because of your Bruener comments. Lastly I will tell you about my beloved dog Franklin. 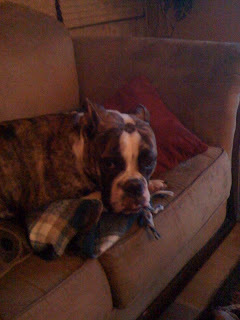 He is an old English Bulldog. My favorite thing about him is when I come home from training and he is just so excited to see me. I love how he just wants to be by my side all the time. Also, I love to hug and hold him even though he is around 60 pounds now. I look forward to getting home on Sunday aand relaxing with my boy Franklin. Until another time. I am not very funny. Oh and I am probably gonna get trashed on for what I say on this blog by the team mates. So please give me some love. When you get back to Columbus, I'll buy you all the goldfish you want! And Franklin is adorable! Just so I'm clear, we're not talking actual goldfish, right. That would be kind of messed up. I mean, pals don't eat each other's pets. Poor Brunner. I love goldfish too. I feel you, man. And if you need a new euchre partner, my group of Crew friends plays weekly. We could always use a sub. Why is Eric misspelling his own name? Does his mother know about this? Danny's mother is a school teacher, maybe she can help him with his spelling. Umm, we are talking about goldfish crackers aren't we...? Because actual goldfish would be just wrong. I believe Zayner actually types all the blogs, hence the similar writing style.